You might have a memorable experience to offer. But you might also have a problem. The noise on most communication channels might make people not notice it. And such was the case of The Dortmund Concert Hall in Germany. This was the case until people got an unusual call to adventure from cows that listened to classical music. 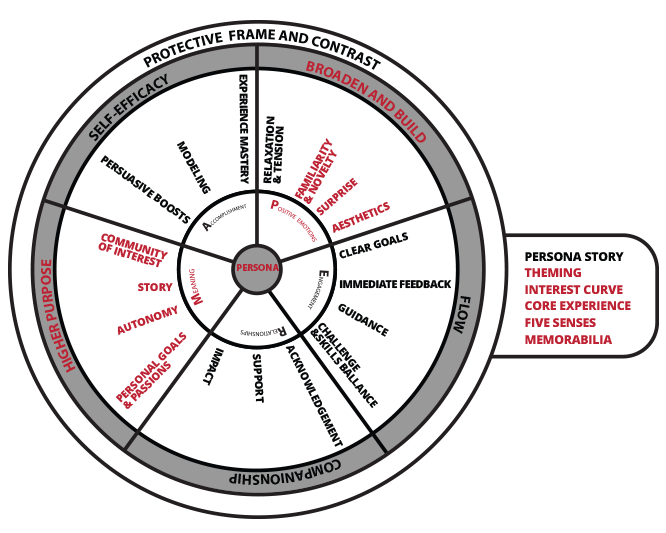 Now let’s analyse why the campaign became memorable by using the Memorable Experience Design Framework (framework explained here). The red highlighted text shows the components used in the campaign. The persona is always the focus of the experience. The campaign had a clear persona stated, a local person from Dortmund that has no interest in classical music. The Experience Enhancers are found at the right side of the Framework. They serve as a guide for the creation of the experience concept. Here theming, the interest curve, the core experience, the five senses and memorabilia was used. The theme is classical music. 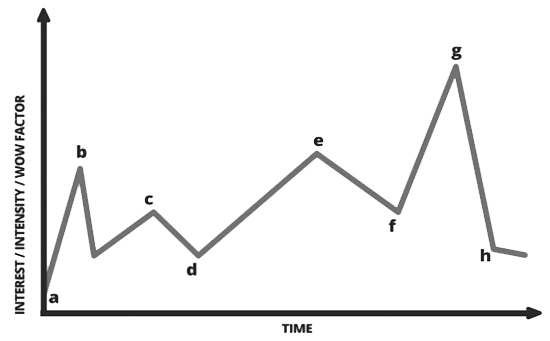 The bottle of milk represents point a in the Interest Curve Figure (Interest Curve explained here). It acts as the experience hook or call to adventure. The product helps raise interest about the Concert Hall experience and also sends a call to action for the potential participants. Those who chose to participate will continue with the next points once their concert experience will start. The reason why the campaign works good is because it has a clearly defined core experience. This is: a call to adventure for joining a classical music concert at Dortmund concert hall. I love how the five senses are used in the campaign. First in the production of the milk (enhancing their milk production by letting cows listen to classical music) . Second when people buy the product: how the bottle looks and feels, how the milk smells, what type of music are they promoted to think of while drinking the milk. All of these even elements are even influencing the way the milk tastes. After a mindful milk drinking experience that associated itself with classical music, you can’t help it but think about classical music more than you usually do. The milk bottle has a beautiful design and also short interesting information about the music composer. It also gets personally attached to buyer because the unusual bottle is prof of being part of this experience. All of these facts might make out of the bottle a powerful experience memorabilia. Positive emotions are one of the main ingredients that have to be stimulated increase the chances for people to have a memorable experience. By stimulating positive emotions in an experience you will help the participants broaden their thought tendency. This will make them build their experience with actions triggered by the broadening. For example, one of the main positive emotions stimulated by the campaign was interest. This positive emotion made the buyers act in a certain way. They were curious about the Concert Hall and also about the taste of the milk. The milk production was mixed with music and as an effect triggered the emotion of interest. People where not only mindful about the taste of milk but they also got interested to some degree in the concerts and classical music. No one expected such a product on the market. It came as a surprise when people saw the milk in the supermarkets. This surprise helped trigger a multitude of positive emotions in buyers and also a positive attitude towards the product and the experience proposed. The design of the bottle and the labels are beautiful. This attracts people into looking at the bottle and also maybe keeping it as a memory. Meaning is another pillar that has to be designed for when staging a memorable experience. People love to be part of goals that are higher than themselves. The way in which the campaign conveys meaning and attracts people to the Concert Hall is by using a story. The story tells that cows produce more milk when they listen to classical music. By exposing them to different musical compositions cows produce the sound of music, sip by sip, artist by artist. The campaign is aligned with the goals and passions of the target group. The goal of each buyer is to drink or use milk. Some of them might be passionate about music but never thought of going to a classical music concert until they found out more about it in an innovative way. The campaign gives freedom to chose. The milk has the same price as other milk products offered. By buying the milk you don’t have to agree that you will go and listen to classical music. The decision depends only on the buyer. At the Hall after the Concert, socialisation time is scheduled. Here a community of interest can be joined or created. This is being enabled by a relaxed environment where spectators can share their experience over a glass of milk. What product can you use in tourism to send a memorable call to adventure for your potential guests? How can you also use the other pillars of the framework (Engagement, Accomplishment and Relationships) to link the products to your tourism experience?